Music during your swim gives you the drive and motivation to see you through to the last stretch of your workout. With the latest 2013 edition of the Speedo aquabeat 2.0 waterproof mp3 player you can expect up to 20 hours play time in the pool. The Speedo Aquabeat 2.0 is an upgrade of the original Aquabeat waterproof mp3 player with a 4GByte quadrupled memory capacity, a new LCD screen and a waterproof radio & extended play time. The easy-to-use buttons enable you to blindly skip tracks and select your favourite song to swim too. Uploading your music couldn't be easier with the Speedo Aquabeat 2.0 just drag and drop your mp3 files to your Aquabeat and create playlists with the editing software supplied. 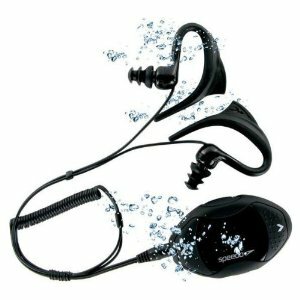 Speedo Aquabeat 2.0 package includes a USB & extension cable, a range of different size ear buds and a carrying case. The Speedo AquaBeat 2.0 is compatible with MP3, WMA, FLAC and APE formats, and with 4 GB storage capacity has enough memory to hold around 2,000 tracks. The battery lasts for approximately 20 hours per charge. 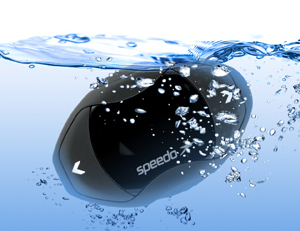 The Speedo AquaBeat 2.0 even has a built-in pedometer and stop-watch & waterproof radio. Comes with a one year manufacturer's warranty. 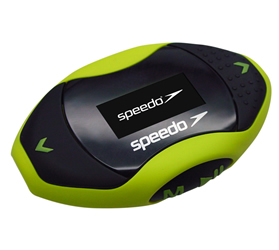 We supply the Speedo AquaBeat 2.0 in black colour only.